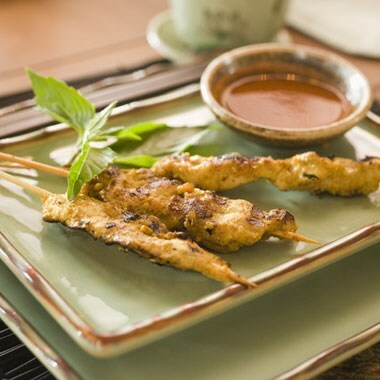 The perfect appetizer for an elegant cocktail party, this satay has a complex blend of flavors that melds perfectly with shrimp or chicken. In medium saucepan whisk all ingredients together. Heat to a slight boil, reduce heat and simmer for 10 minutes or until sauce thickens. Serve with thinly sliced broiled or barbecued skewered chicken breast, beef, or tofu. *Found in the ethnic foods aisle of most grocery stores.